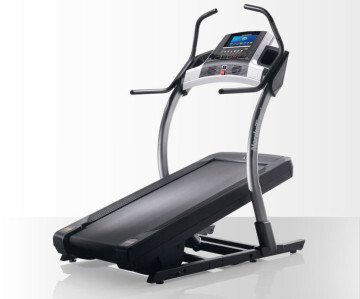 NordicTrac X9i Incline Trainer is new and improved, at least that is the hope. Remember in the good old days it was amazing that exercise machines plugged in at all? Now they have Android browsers with a touchscreen, complete with iFit Live readiness and even, of course, solid workout programming, which are all NordicTrack’s style. The new trainer X9i is a lot more expensive, though again, it has some excellent features. Though, one drawback is that the warranty is less robust than on prior NordicTracks, particularly when factoring that this model excludes all electronics from the warranty. No matter what, the Trainer X9i is particularly good at giving that solid NordicTrack workout efficiently. It does include incline training or can be used as a flat trainer, tilted up at a 40 percent incline, or even declined up to 6 percent. That 40 percent incline can burn up to 5 times the calories of walking on flat surfaces. The decline training helps tone muscles. There is a console fan to get you through more challenging portions of your workouts. There is a reflex cushioning built in for less stress on your joints while enjoying a solid and firm pushing off point and a soft landing spot. As compared with running on concrete or even roads, this track is much gentler and healthier for your joints because it lessens the impact so much. If you would like to incline, it is still easier on the knees as compared with even treadmill training. This is so because the Nordic Track X9i shifts your body weight. It has a 3 HP motor that is comparable to commercial brands with a lifetime warranty. It is quite responsive, responding quickly to both incline and speed. X9i has an impressive 44 programs built into its console. Twenty-four are the traditional treadmill programs to target calorie-burning, intensity, and speed. Twenty of the training programs are for iFit Live with Jillian Michaels and include Google Maps workouts, among others. While working out, enjoy the touchscreen with an Internet browser that lets you stay connected with your world. Use email, check sports, and post on social media. iFit Live is an interactive exercise mode that lets you work out with Jillian Michaels and download your own customized workout place while competing in online treadmill races. The iFit Live feature does make it more useful for training for races and marathons as Google Maps recreates routes and adjusts the treadmill incline and decline to match the actual terrain. The heart rate monitor has sensors in the handlebars to monitor heart rate. The NordicTrack is never known as a great budget machine. Though, if you are particularly tall, it is THE machine to buy. Even if you do find a sale you may be forced to make a tradeoff by ending up with a less robust warranty as a result. Plus, the warranty is already less complete as previous models. For instance, the electronics on the older machines were covered but is not included on the newer models. The X9i includes many great features, including the iFit along with Jillian Michaels, and the Google Maps workouts. With 44 workout programs, there is something for every type of athlete. The cushioning is excellent for anyone with concerns about preserving their joints. Any of the NordicTracks provide a solid workout, though this one does have some excellent electronic tools in addition to the standard features you have grown to love.